Wireless Medical Mouse | Waterproof & washable (IP67) anti-microbial wireless optical mouse with 3 button scroll function | Armagard Ltd.
Wireless silicone rubber mouse and miniature USB dongle ideal for medical use. 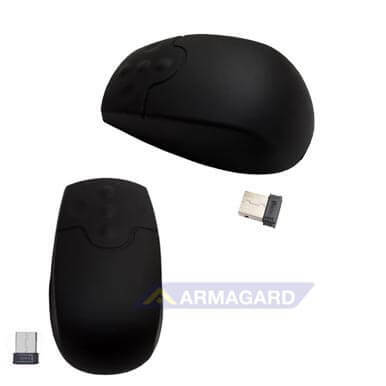 The 2.GHz wireless connection is capable of controlling precise, smooth pointer movement from over 4 meters away, the mouse is washable and contains nano silver anti-bacterial components to actively reduce bacterial build up on the surface of the mouse. Manufactured from silicon rubber and powered by battery this wireless mouse has all the functionality of a standard mouse including: left and right buttons and 3 button scroll wheel. Compatible with Microsoft Windows Vista/XP/2000/ME/98, this fully sealed IP67 rated mouse is easy to clean and disinfect. The anti-bacterial, nano silver rubber casing combined with wireless technology will permit use of the mouse in any medical environment where the build up of bacteria or other contaminants would prevent the use of a regular mouse. The rubber casing will tolerate regular cleaning with with many medical disinfectants including CIDEX, alcohol, 10% bleach solution, and the wireless connection allows remote use and means that there is no wire to keep claen or get in the way. All Armagard products are constructed according to European IP and International NEMA standards, ensuring protection from liquids and particulates.